One of the well known personalities on the Coalmont landscape is moving. 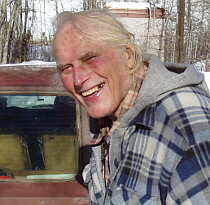 Abie, who’s real name is Eberhardt Nipkov, has lived here since 2003. He first visited this area in the 70s, but it was in the 90’s that he started coming to stay at the Granite Creek Forestry campsite. Even back then he was known for his red diesel VW Rabbit, a model who’s engine and mechanical details he probably now knows better than most people ever will. His attitude of tenaciously insisting on conquering mechanical items in his life is in his blood. His grandfather, Paul Nipkov, was the inventor of mechanical television which paved the way for modern television.